Yesterday on Nickelodeon, the long awaited episode 'Trans-Dimensional Turtles' premiered... and let me tell it, it does right everything that 'Turtles Forever' did wrong. Of course, let's get the plot out of the way, The current version of the Turtles are transported to the dimension of the 1987 Turtles where they team up to stop Krang who intends to wipe out all of reality. And while the plot is 'similar' to Turtles Forever... in fact, it's the same plot right down to the 'take out the original B&W Mirage Studios version of the Turtles' bit... this felt more of a celebration of Turtles franchise because it wasn't treating everything associated with the 87 Turtles like complete jokes the way Turtles Forever did. 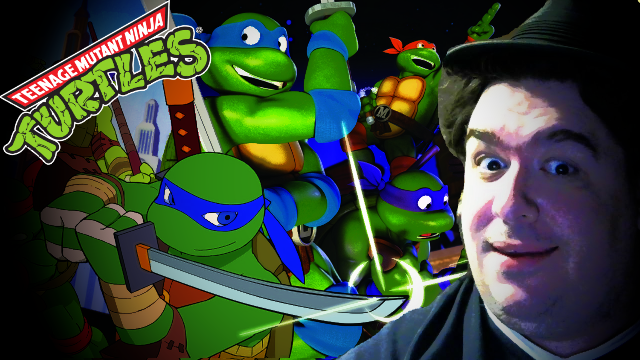 So lets get to the positives here... for one, this was the second time to my knowledge the 87 Turtles appeared in the current cartoon, the other being "Wormquake!" to which this episode ties into with how that episode ended... and like it, all four Turtles are voiced by their original voice actors... Barry Gordon is back as Donatello, Cam Clarke is back as Leonardo, and Townsend Colemen back as Michelangelo, which leads to a cute little in-joke regarding Rob Paulsen, who voiced Raphael in the 87 series and Donatello in the current series. Second, as said before, the 87 series isn't treated as a joke, and actually gave Krang (voiced by Pat Fraley) a lot of the bad-assery that was said to be associated with him that we never got to saw in the 80s. Fact is in his 'giant man baby / wrestler' styled body, he takes on all 8 Turtles and actually holds his own. Keep in mind, beyond the original mini-series, Krang never really went toe-to-toe with the Turtles. Also, this episode actually explains why Krang was banished to Earth (or the Earth of the 87 Turtles) in the first place. World expanding... I love it! If I seem to be gushing more over the 87 Turtles side of things...well... I'll admit, I'm haven't watched the show too much. I did like what I saw here... even if the current Leonardo sounds like he should be a van-driving werewolf... but their designs seem a bit too....plain, and this really shows when you see the 87 Turtles done up in the 3D rendered style. Also should mention the Mirage Turtles... and in a twist, seems to looking to kill the Donatellos when they drop in to retrieve the device to save the Turtle-Verse.... if you're familiar with the original Mirage Turtles, you'd know this is not at all shocking. If I had to give one complaint... it's that it was over too soon, but as I said, it fixes the big problems Turtles Forever had... and that's the important thing. Of course that's just my opinion, check out the episode and make your own judgement.